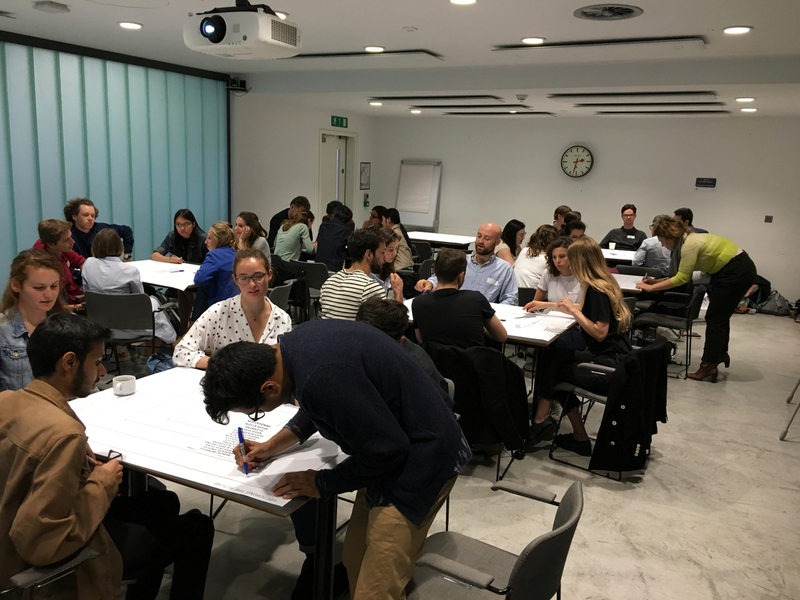 Last month I ran a workshop at the univerCities one-day conference on urban innovation and entrepreneurship organised by MA/MSc students from the urban design, sustainable cities and planning courses at Kings College London, LSE and UCL’s The Bartlett School. The event was billed as “a unique inter-university and cross-disciplinary conference on the topic of solving today’s urban challenges”, and featured panels of speakers from a range of different backgrounds to address questions of equality and inclusivity in housing development; humanising the city though urban design; and trends and challenges in urban futures: citizen engagement, digital participation and tech innovation. I was asked to devise a workshop for the afternoon session to bring focus on engagement and the future in urban design and planning. I decided to adapt the methods I used in a previous urban futures workshop I ran back in 2015 (Peeking over the Horizon) – which aim to push people further in their thinking than just talking about whatever innovations which already exist are at the forefront of their minds. The workshop was titled, Beyond Engagement, to address a signature problem in fields such as planning and urban design – namely that citizens are often subject to engagement and consultation processes and exercises which rarely report back to them or offer any real agency in the process. So many consultations and engagements are simply hollow, ‘box-ticking’ attempts to provide a veneer of transparency and democratic involvement, often to mask decisions already taken. This workshop aimed both to build upon the themes and talks from the earlier panels and to inspire the participants to think beyond just engaging or consulting citizens, and to try to anticipate the impacts and outcomes of innovative practices in their fields, and their intersectional effects on society more widely. Thinking about the future not just to describe trends on the horizon, but to anticipate what ‘next practices’ and effects might be. The workshop had two exercises – “Vectoring the Future” and a StoryCubes experiment to finish. “Vectoring the Future” uses large worksheets with 6 ‘vectors’. Participants chose which vectors they wanted to think about (themes such as, Public Benefit, Private Profit, Infrastructure, Health & Wellbeing, Work & Leisure, Housing, Equality, Inclusivity, Privatisation Public Realm, Private Space, Sustainability, Resilience, Planning, Regulation, innovation, Enterprise) and worked from the outside of the sheet inwards. The outer section providing a space for describing the state of the art or cutting edge innovations in each vector. The next section providing space to reflect on what potential impact or consequences they might have, with the next section for imagining what the next directions such effects would suggest. In the centre is a space for anticipating the ’emergent’ qualities and effects that might arise from the intersection of innovations, effects and next directions across the various vectors chosen by the participants. At the event, we had 6 tables, each with 5 or 6 participants who each completed one of the worksheets. Once each group had completed the process, they reported back, giving a summary of what vectors they had chosen and how the conversation had flowed towards the space of emergence. Interestingly, each group found a unique perspective even when they shared similar initial vectors and the quality and range of the discussion across topics of technology and innovation in particular was significant. After a short break, we returned for the final StoryCubes exercise – a simple and fun way to bring things together and open up the discussion even further. Each participant was given a StoryCube and asked to write 6 things on it that they thought were most interesting or important to them from the whole day. Then I asked a first participant to put their cube on a table in the middle and describe one or two things they had written down. From there, then next person came up, placed their cube next or on top of another and linked it to one of the themes on someone else’s cube. Eventually building up a structure of connections between issues and ideas people felt had inspired or motivated them, as well as revealing gaps and other issues that were still to be explored. I was really impressed by the energy and focus of the event and its participants, as much as by the ambition of the organisers : a brilliant initiative by students from different universities to come together to learn from each other and value their different disciplinary perspectives on shared problems and issues. This entry was posted in Workshops and tagged engagement, KCL, LSE, storycubes, sustainable cities, UCL, urban design, urban planning, workshop on July 10, 2018 by gileslane.